Just like people, when pets need surgery due to illness or injury, they often need blood transfusions. Without donors, there would be no blood available and those pets might die. Every day hundreds of animals need blood transfusions, but there are few national animal blood banks. With such a severe shortage of blood, many clinics depend on in-house blood donors for blood. A donor dog must be healthy and friendly, weigh more than fifty pounds, be between one and seven years old, be current on vaccinations and free of parasites. The animal must not be on any medications except for heartworm or flea prevention drugs. Their heart must be sound (no murmur) and they must have the universal blood type. When an animal meets these requirements, their blood will be sent to a lab to test for infectious diseases and they will be cleared to become a donor. At AVC we are fortunate to have two “on-call” blood donors. 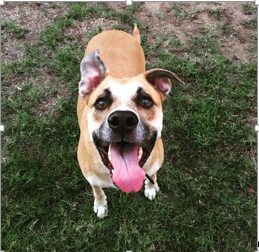 Carly is a six year old pit bull mix whose energy and friendliness make her a great donor. Carly loves to swim, run, and dig in the trash. 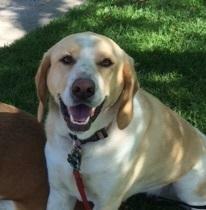 Sadie is a six year old Basset hound mix whose gentle nature makes her a good candidate for blood donation. Sadie enjoys barking at strangers, naps, and counter-surfing. When a dog donates blood, a large accessible vein, typically in the neck or the cephalic vein on the front of the foreleg is used. The area is usually clipped, cleaned, and aseptically prepared before insertion of the needle. The donor is gently held sitting or lying on their side. The needle (from a standard human blood collection kit) is gently inserted into the vein until a free flow of blood is obtained. Collection time is usually about 10 minutes for a full bag and varies from donor to donor. There are rarely any ill effects after a donation. A light dressing may be applied afterwards to keep the area clean. Blood donation is not dangerous for your pet, requires very little time, and helps save lives! At AVC, our blood donors are treated like royalty, fawned over, and given lots of treats. If you think your pet has what it takes to be a donor, contact the staff at AVC.